After Romney's Loss, Mormons Lament What Might Have Been : It's All Politics Mitt Romney's White House run raised the profile of his Mormon faith, and made many fellow Mormons hope that misunderstandings of their faith could be dispelled. And, of course, there was pride in seeing one of their own come so close to the White House. Those hopes were dashed with his loss Tuesday. Mormons line up outside the historic Salt Lake Temple for an annual conference in April 2010. Given Utah's Mormon majority, and its dominance of the Republican Party and most elected positions in the state, it's safe to say the crowd was predominately Mormon. There was complete silence for the first time all night as Romney spoke. Some in the crowd choked back tears. Utah gave Romney his biggest election victory Tuesday night with 73 percent of the vote. "This is not about religion," said Lara Marriott, a health and fitness saleswoman who attended Romney's Mormon congregation in Massachusetts when he was the top local leader. "This is about our country," Marriott added. But she and others deeply disappointed by Romney's loss also reflected on the gains and losses for their faith as its latest spotlight fades. 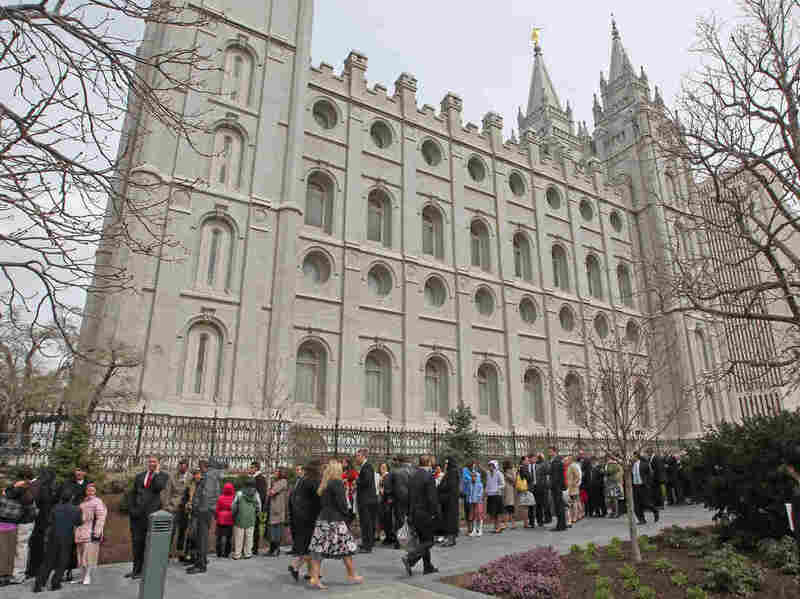 "He definitely helped bridge the gap between believing things that are not true and what Mormons really believe," Marriott said. "There's more acceptance of our faith," added Elizabeth Crofts, who was seated at a table with Marriott as they watched election night returns. "There's more interest in our faith." Romney's candidacy focused intense attention on the faith. Last Sunday, television crews from around the world filmed at Mormon Sacrament Meetings in Utah and Massachusetts. It was a regular monthly day of fasting and prayer, and some of the faithful told reporters they were fasting and praying for a Romney presidency. "I don't know what would have been," said Louvonne Newman, a customer service representative from Willard, Utah, at the deflated Republican gathering Tuesday night. "I guess we'll never know." Romney, she said, is "definitely a great ambassador for the Church of Jesus Christ of Latter-day Saints. It would be nice for people to know more about our religion. I get tired of being called a cult." Newman said that a Romney presidency would have, by example, presented a positive image of the faith. "He's a fine man, and he has a good character; and that comes from his roots, which are influenced by his religion," she said. But some also recognized that a Romney presidency could have triggered even more scrutiny for the faith. Some would have tried to link Romney policies and decisions to Mormon leaders, including the president of the church, who followers believe is a prophet of God. "The prophet guides us," explained Bill Marriott, who sells farms and ranches in Utah. But "we choose what to do." Bill Marriott insisted that Romney, as president, "would choose the best course for the nation." Brian Birch, an administrator at Utah Valley University in Orem, Utah, told The Salt Lake Tribune that Romney's loss "may be a blessing for Mormons concerned about further public scrutiny of their faith." Birch told the Tribune that "a Romney presidency would almost certainly have kept Mormonism under the microscope for many years to come." Mormon leaders issued a statement late Tuesday night congratulating President Obama and calling for Mormons and people of all faiths to pray for the re-elected president. "It is a long tradition among Latter-day Saints to pray for our national leaders in our personal prayers and in our congregations," the statement said. "We also commend Governor Romney for engaging at the highest level of our democratic process ... We wish him and his family every success in their future endeavors." A church spokesman did not respond to NPR's request for further comment. "People now understand that Mormons don't have green horns," said Lamont Green, an airline worker and state Republican convention delegate. Romney's candidacy, he added, "dispelled a lot of the criticisms." In fact, Romney's Mormon faith wasn't much of an issue after the primary season ended and he secured the nomination. Even evangelical Protestants, who were wary of Romney's candidacy in the 2008 primaries, supported him in great numbers going into the general election, according to a July survey conducted by the Pew Research Center for the People and the Press. Philip Barlow, who teaches Mormon history and culture at Utah State University, told the Tribune that the faith itself "developed a thicker skin in the eyes of the world" during Romney's presidential quest. "And the world could see that a Mormon who runs for office isn't, by definition, a nut case."